I have known about Apture for a while, since they work in the same way as click.to. Apture was born from the idea that you would want more information from a given topic. You could just highlight the word and execute a search on Google, Bing or Yahoo. They were bought in November of 2011 by Google. No doubt, it is a great function and a thing that we’ve been working to perfect for quite awhile. Google did acquire the talented people at Apture along with the company itself, so we could see some great things coming from the team. I think what makes Apture different from click.to is the over-all reach of Apture. 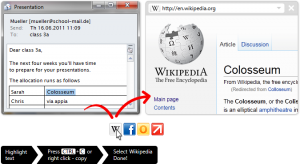 click.to will pull up a search from anywhere you find a word that you want to search. Not only that, but we are able to give users the ability to move other types of data, such as photos and video. If Apture’s goal was to bring more depth to articles, I think they got it right (I assume that was the goal, since they were working directly with publishers). What we at click.to want to achieve is an overall user experience! 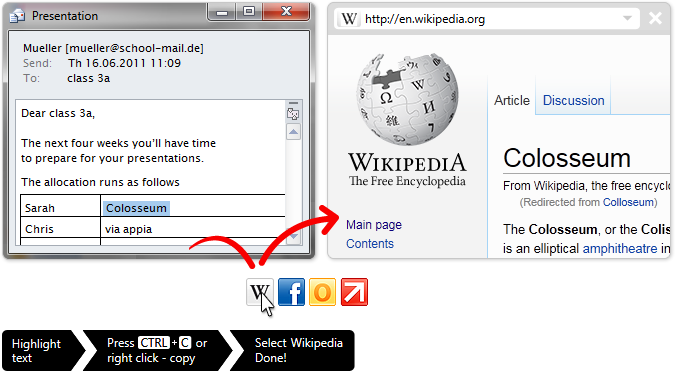 You can highlight a word and click.to Wikipedia, which then pulls up a quick view box that the user can read without ever leaving the original source (Be it a desktop or web source), this was not included in the early versions of Apture and even later it required line manipulation from publishers themselves. With click.to, you don’t require any extra work from publishers or users to get it to do the search properly. Verdict: (although slightly biased) is that click.to can do everything that Apture can do and more! They have built a great product and it’s inspiring to hear them talk about what they’ve built! Its also great how they organize the data in the quick navigate window. I’m sincerely happy for them and I don’t think that Apture will be going anywhere soon, (especially since they are now owned by Google). I also don’t think that you should limit the ability of the user to search for information to one platform (in this case Google). It is really neat how they move the on-line experience forward. click.to will remain focused on our users and try to give them as many choices as possible to help their on-line and off-line experiences, including the ability of our users to customize our program. I think there is enough space for both of us, but until Google decides which direction they are going to take Apture, why don’t you try click.to!